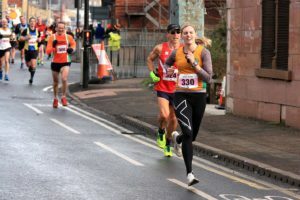 Race Date Sunday 3rd February 2019. Dewsbury is considered an excellent 10k pb course, a flat out-and back route with under 140ft of ‘climb’ along its 6.2 miles. Held on the first weekend in February, it can be a cold one, as was certainly the case this year, but is a good way to get the competitive year underway. There were 1714 finishers.Chris Parr of Jarrow and Hebburn won, in a time of 31:22.Julie Briscoe of Wakefield took the women’s spoils in 35:04. There were nine Striders in attendance with Stuart Carrack leading the way in 34:24.